Emulators are handy tools for people who want to play games on platforms other than the usual console they’re intended for. These are particularly useful for retro games and consoles, which are no longer sold, allowing users to enjoy the games they were hooked on decades ago. However, many game publishers are less content with this practice. Nintendo, in particular, has repeatedly called out ROMS and emulator sites, both in and outside the United States. The defendant has yet to respond publicly to the allegations and at the time of writing and both LoveROMS.com and LoveRETRO.co remain online. Update July 22: LoveRETRO has been pulled offline. LoveROMS, meanwhile, has removed all Nintendo titles. Update July 23: LoveROMS has shut down as well now. 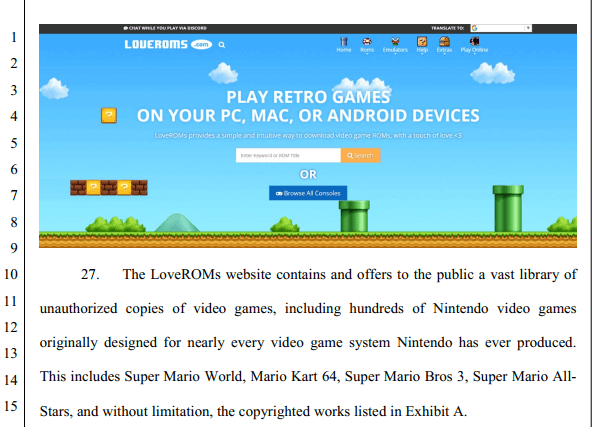 A copy of Nintendo’s complaint, obtained by TorrentFreak, is available here (pdf).